Can I Play Baba Ijebu Online? Read 2 Reviews! 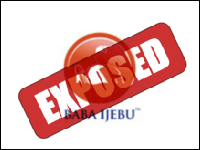 Baba Ijebu Exposed — Where Can You Play Premier Lotto Online? What comes to mind when you think about Nigeria? The truth of the matter is that most people have some negative thoughts and they quickly imagine the infamous Nigerian prince. The good thing is that Nigeria is known for a lot more than that. The country has a pretty nice lottery that is gaining popularity across the world today. This lottery is called Baba Ijebu. Baba Ijebu (Premier Lotto) is an official lottery in Nigeria. Set up back in 2001, the game has gained a lot of popularity because of the daily drawings and the prizes that it hands out on a regular basis. The game is a fixed odds opportunity that features a couple of modes players can choose among. This flexibility is the one that sets Baba Ijebu apart from other lotteries out there. If you’re looking for something a bit more intriguing, something that stands out of the normal format, giving Baba Ijebu a try would definitely be a good idea. Is it a Scam and Can You Play Baba Ijebu Online? Premier Lotto’s Baba Ijebu is anything but a scam. As far as playing Baba Ijebu online is concerned, we’ll take a look at this opportunity in a separate section of this guide. The gaming company was set up in 2001 as an official entity in Nigeria. The management team has over 40 years of experience in the field – experience that has been used to develop a completely legitimate and sustainable national gaming opportunity. Currently, Premier Lotto works with 200 agents and 16,000 retailers throughout the country – a fact that turns it in the largest lottery operator in Nigeria. The company offers one fixed odds game at the time being. The biggest specific of the game is that players don’t bet against each other. Rather, they bet against the operator in an attempt to win the prize. Baba Ijebu is completely legitimate and regulated by a national legislative framework. All of the drawings are broadcast live – yet another characteristic that reveals the legitimacy of Baba Ijebu. Playing Baba Ijebu is a bit more different than giving other lotteries a try. Here are the ways to participate. The second gameplay mode is called NAP3. In that instance, players choose three numbers in the pool from 1 to 90. In order to win, all three of the numbers have to be drawn in the respective edition of the game. The prize will be the player’s original stake times 2,100. In NAP4, the multiplication is x6,000 for the players that manage to get all 4 numbers correct. Finally, the most challenging option that provides the biggest payouts is NAP5. In that instance, players have to guess 5 numbers from the pool of 90. If they accomplish the goal, the payout will be the stake times 44,000. It’s possible to purchase Baba Ijebu online and via a smartphone for people who are located in Nigeria. More details about these opportunities will be provided in the coming sections of the article. As you can see, there’s a lot of flexibility that stems from the numbers you choose and your original stake. As a result, it’s a bit difficult to provide more details about the prize structure and the payout that players can receive. There is no prize pool for the drawings and the sum that one player gets is entirely independent from the prizes provided to other players. Baba Ijebu is not a pari-mutuel game. Regardless of the number of winners, the prize is always the stake multiplied by the multiplier that applies to the specific combination. The biggest prize in the history of Baba Ijebu was 120 million Nigerian Naira (546,471 US dollars). Players have seven days from the date of the drawing in order to make a prize claim, regardless of the sum. Payments are usually handed out at the Premier Lotto Payment Centres. More information about these facilities is available on the lottery’s official website and it’s also good to know that the centers welcome visitors 24/7. According to Nigerian law, a personal income tax applies to sums won through the lottery. Going through regulations or talking to an experienced local attorney/accountant will shed some light on the percentages. Can You Buy Baba Ijebu Tickets Online? You can buy Baba Ijebu tickets online if you are currently in Nigeria and you’re a resident or a visitor of the country. Unfortunately, Baba Ijebu bets can’t be made through an online lottery agent at the time being. International players who find the opportunity curious will have to wait some time until Baba Ijebu is picked up by one of the online platforms. Would you mind rating Baba Ijebu? Baba Ijebu is certainly great. It doesn’t cost a lot to give it a try. In fact, you’re in charge of the sum that you’re going to spend. If you are currently in Nigeria or you plan a visit to the country, giving Baba Ijebu a try may be a good thing for you. When you do, please don’t hesitate to share your experience with us! Whaoooo its a great game keep it up guys let keep winning…..
I’m so glad to see this game here. My absolute favorite way of playing is 2sure. Although if you are more risk averse you can try perm but with 2sure am always sure of my winning. This will forever be my favorite.